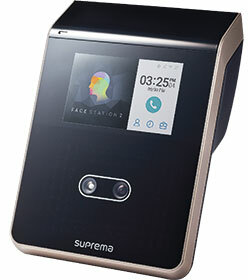 Recently launched, FaceStation 2 brings fast, accurate hands-free access control to the luxury high-rise apartment market. It offers a massive memory capacity and can accommodate up to 30 000 users, 50 000 face image logs and 5 000 000 text logs making it ideal for any site, large or small. FaceStation 2 can recognise a face even in an environment with 25 000 lux, which is equivalent to full daylight (not direct sunlight). This allows for indoor installations at locations near windows, lobbies and building entries. FaceStation 2 performs equally well in total darkness. Enhanced security is provided through Live Face Detection: IR-based image analysis to prevent spoofing by printed images and LCDs, enhanced security by Android 5.0 Lollipop and high quality image logging. Ergonomically designed, the angle and position of the cameras on FaceStation 2 ensures that even tall users are comfortable using the device and an optional tilt-bracket can be used to accommodate wheel-chaired persons and children. FaceStation 2 can work as a video intercom, eliminating the need to install a separate intercom system, giving residents control over their visitors. generation mobile phone supporting NFC or BLE, totally eliminating cards where multi-factor authentication is required.